Hello nail friends. Life my blogging schedule has been kind of crazy lately. I think it's because of summer. Work is slow so I get home a little earlier and I somehow become exponentially lazier the more free time I have. I've been watching a lot of Netflix and just signed up for Kindle Unlimited on Friday. I'm already half way through my second book. I can't help myself from binge-hobbying whatever it is I'm doing. I've also been painting a ton of nails but just can't bring myself to sit in my hot, stuffy office editing all the pictures (soooo many pictures). 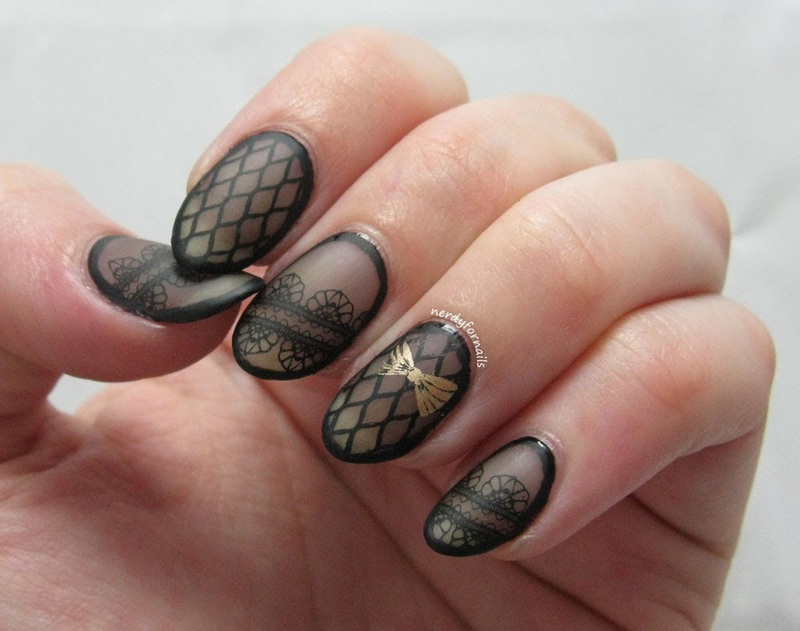 Today I have a lacy manicure to show you. 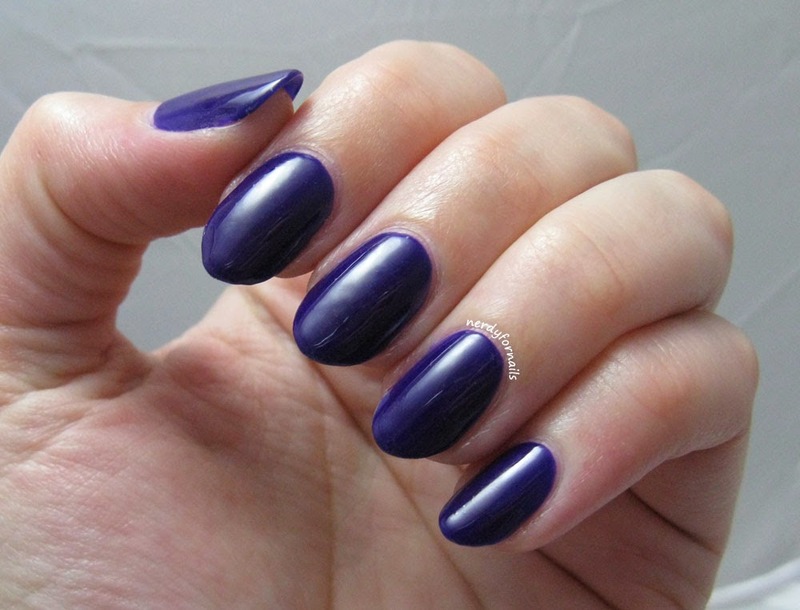 Ever since OPI put out the sheer tints I've been seeing this look everywhere. I mixed up my own sheer black polish so I could try it out myself. 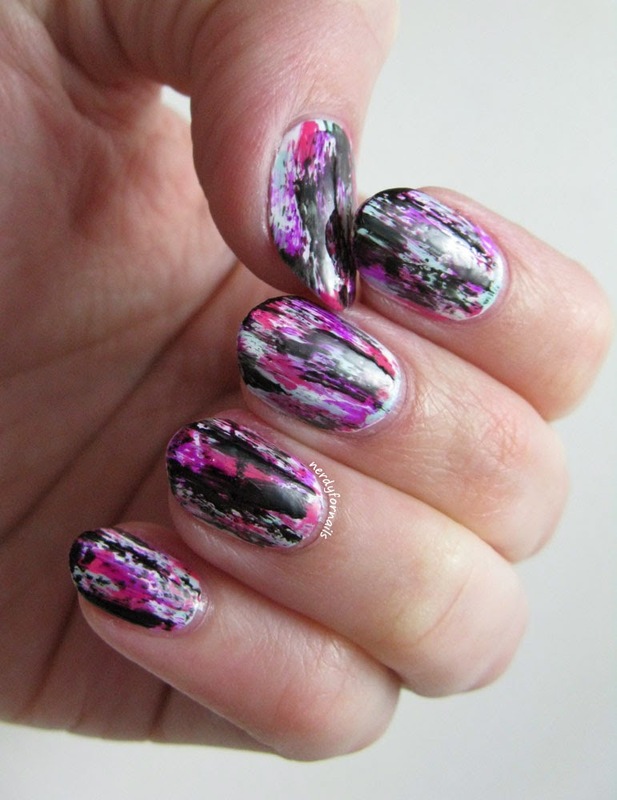 I started with base coat and then stamped the black designs directly onto my otherwise bare nails. 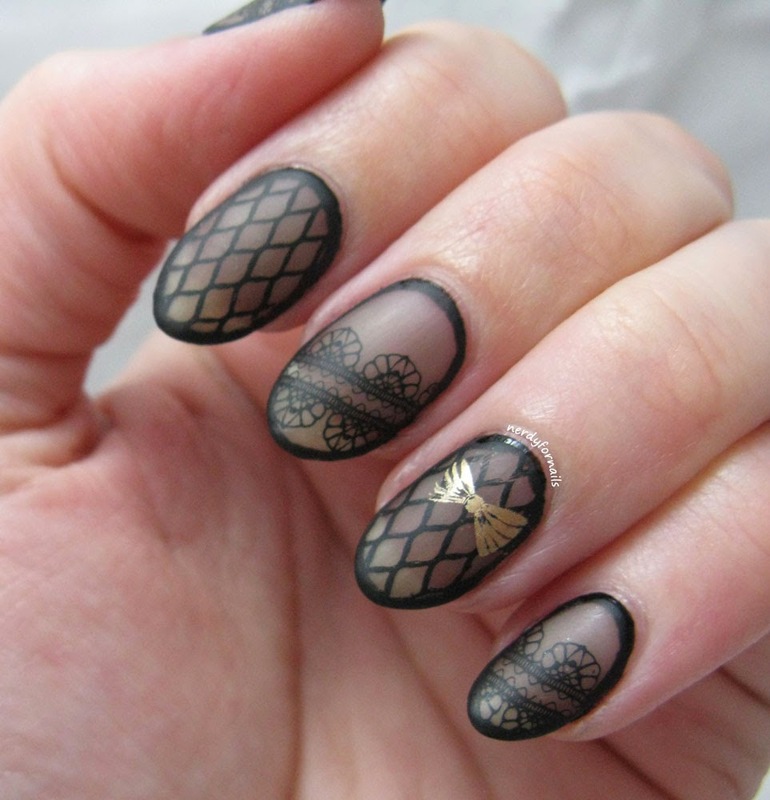 The fishnet stamp is Bundle Monster plate BM-209 and the other lacy pattern is BM-323, stamped with Mundo de Unas black stamping polish. After that dried I layered on three coats of my sheer black polish which I made by adding a few (4-5) drops of black polish to a mini bottle full of clear polish. I think I may add a bit more black into the mix because it turned out pretty sheer. With a little more tint I think I'd need less coats to get the coverage I want. I added a little gold bow accent with plate BM-317 and Maybelline Bold Gold. I used a small nail art brush to paint the black outlines around every nail and finished up with a coat of Wet n Wild Matte Top Coat. This look has a lot going on, but I don't think it's too busy. Everything coordinates together nicely and I love how it turned out. I can't help but think this looks like it would be more perfect for cooler weather though. 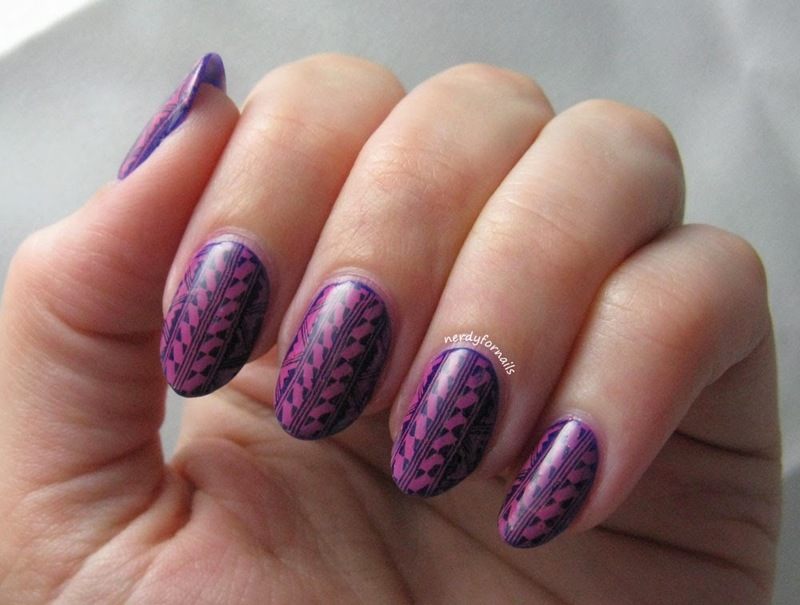 I wanted to update my last manicure with.... wait for it.... stamping! Ever since I got my order from Mundo de Unas I can't stop stamping All The Nails. I'm really impressed with how well they work. 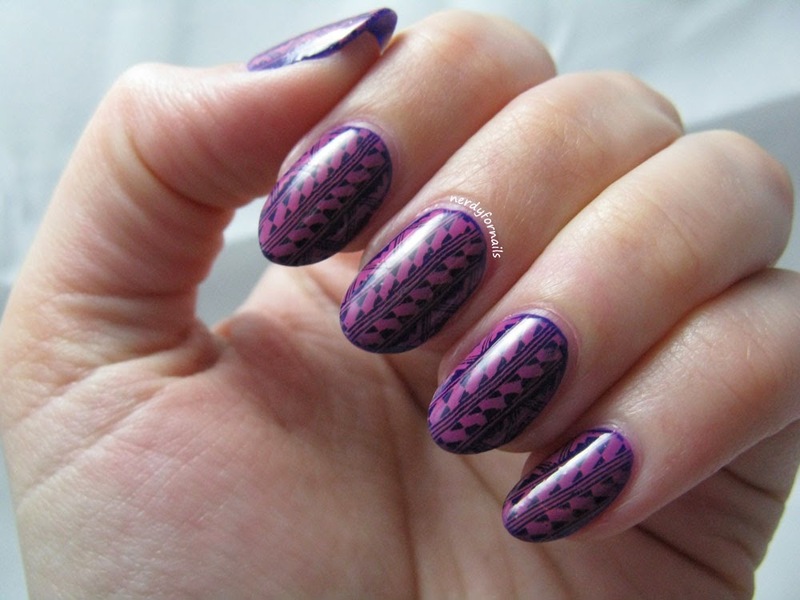 This was a pretty dark shade of purple and the stamping really pops. This reminds me of those crazy printed chocolates that are sometimes used to decorate desserts. I started with two coats of Orly, Saturated and then stamped over it with Mundo de Unas #21 (purple) and Bundle Monster plate BM-221. 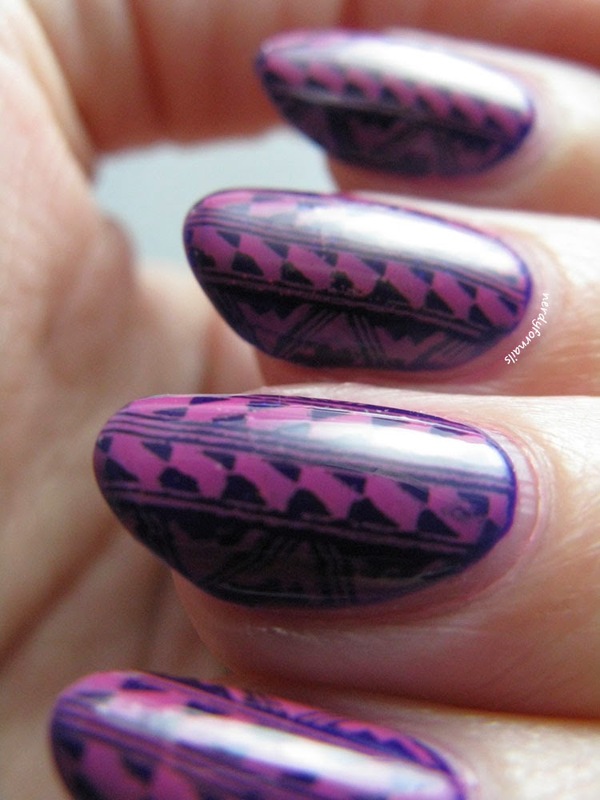 I love how bright the stamping turned out. I hope you love stamping too because (spoiler alert) there's going to be a lot more of it in the future. Purple! Did I mention I love it? Maybe once or twice, or 300 times? I'm a total sucker for a purple polish. 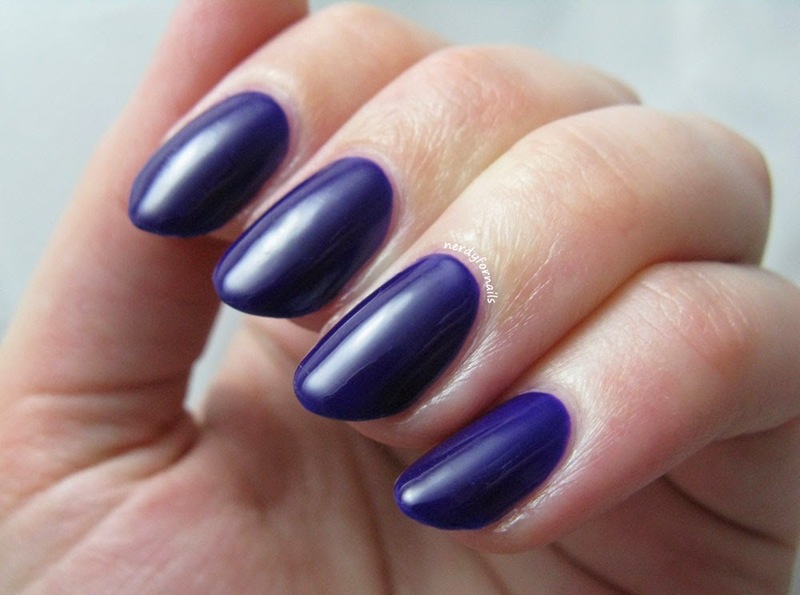 When Orly came out with a true purple neon in their Summer 2014 Baked Collection I knew there was no point in resisting. I picked up Saturated and Ablaze when Sally's was having one of their many BOGO sales and I don't regret it. Does anyone ever really regret buying polish though? It hasn't happened to me yet! I've got on two coats of Saturated which is a rich neon purple. It looks a little dark in indoor lighting but outside it lives up to its name. The formula is typical neon. It dries slightly matte and is a bit draggy/waxy if you don't work fast enough, but overall it has a great application. I've put topcoat over it, but I think it would look nice matte too. Happy Toesday! Now that I got the hang of stamping I can't stop doing it. This time I painted a cute two-tone teal paisley pedicure. Try saying that ten times fast huh? Apparently Toesday is also bad joke day judging from my last post. 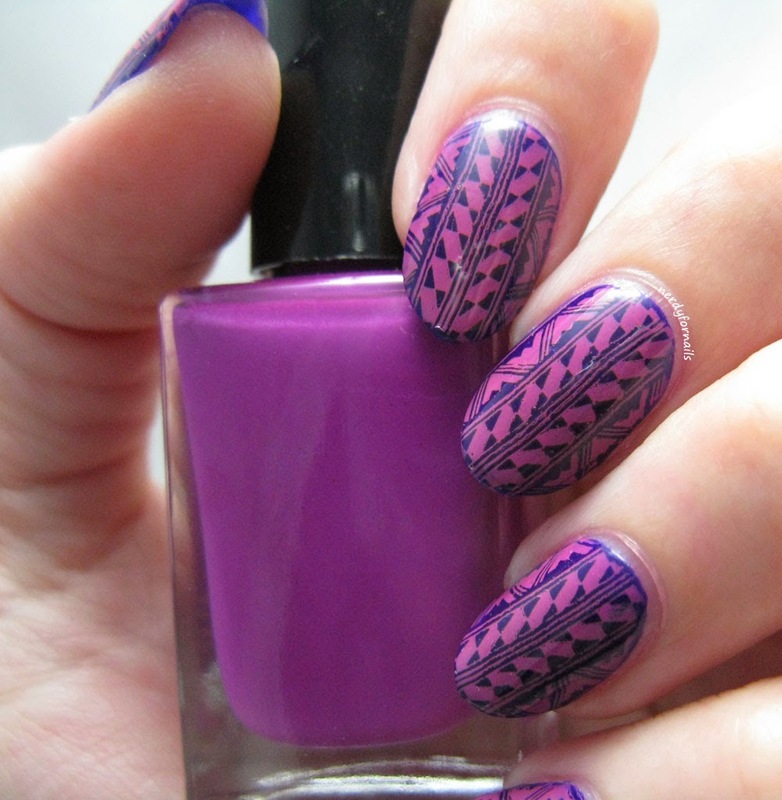 Joking aside, I'm really enjoying playing with my new Mundo du Unas stamping polishes. The images come out so much brighter and crisper than I ever thought possible. It's made a huge difference in my stamping already. The darker shade on my little toes is Island Girl, Aloha Paradise and lighter one is Orly, Jealous, Much? 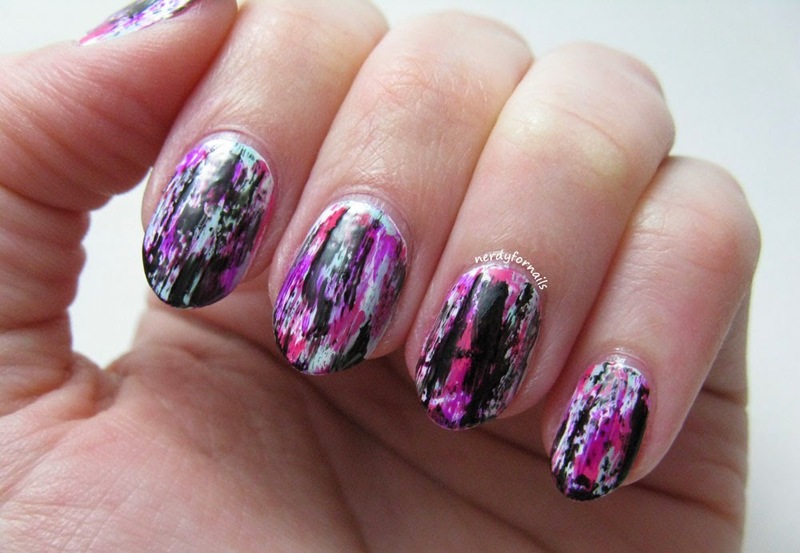 I stamped with Bundle Monster plate BM-315 and Mundo de Unas in Aqua. The paisley design on this plate is so detailed it was hard to get a good picture without being super creepy close up on some toes. I think we can all appreciate it at this much safer distance. This may be the first manicure I've ever taken off almost immediately because I was so disappointed in how it turned out. I know, there's nothing really wrong with it, but it just didn't live up to the stellar original version by Chalkboard Nails. Sarah truly is a nail goddess and manages to make everything look bright and shiny and effortless. Back in reality land this was a little trickier than I had anticipated. I couldn't get the black to drag quite right and my base colors didn't pop enough for my taste. Looking back at the pictures I think it really was fine and I'm definitely too picky and hard on myself. It's a true saying that we're our own worst critics. I won't go into all the details about the technique here. Sarah did an excellent tutorial so there's not much more to say that she didn't cover already. I will tell you what I used though. I started with two coats of LA Colors white polish. The purple is Dream On by Sinful Colors, pink is Hey Baby from the Gwen Stefani collection by OPI and the blue is Mar-zi-panna from Spoiled. I used Wet n Wild Black Creme for the black. I think I learned a few things from this first attempt. I perhaps wiped off a bit too much of the polish for the three base colors and ended up going back over it too many times which led to small bits of patchy color. It really could use more bigger blocks to get the brightness without becoming so muddled. I might also try some different kinds of black polish for the distressing to see if I can find one that more easily gives the proper amount of coverage. Some nails ended up with a bit too much, but that could also have been my technique. I look forward to practicing because I really do love this look. Toesday: What's Black and White and Coral All Over? Remember that old joke from elementary school? What's black and white and red all over? The answer is probably don't Google it because you'll find things like this. I'm not very good at jokes. I'm much better at toes. I still have ten of them and I feel like that's a pretty big accomplishment some days. Today I painted them with a bright summery coral and did some black and white stamping. They kind of scream "look at me" so if you don't like toes click away now. The coral is Ablaze from Orly's Summer 2014 Baked Collection. Ablaze is a neon coral with a hint of gold shimmer which you can't see in these pictures. It's really bright and opaque in two coats. 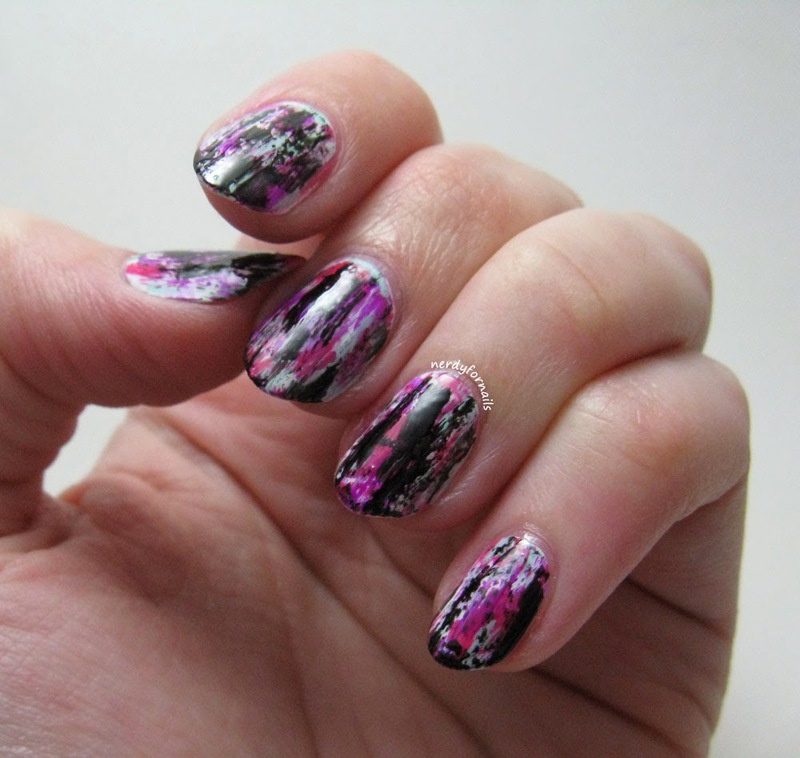 I'll try to wear this again soon on my nails so I can show a proper closeup of the shimmer. On the big toes I started with two coats of white polish, then stamped with Mundo de Unas black stamping polish and Bundle Monster plate BM-204. I've seen a ton of different versions of this black and white pedi with a pop of color and had to try it out myself. This is a lot easier than my last Toesday post, but still has a bit of that tribal look that seems so perfect for long summer days.